I'm making a game with my 9-year-old. You have my attention, good sir. There is nothing about this pitch which is not amazing. Will there be other cool animals like Giraffes or Parrots? 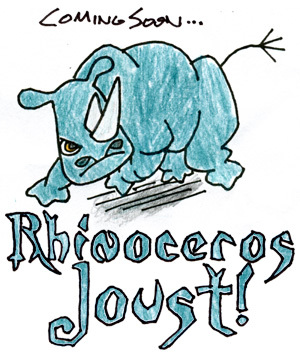 Or is the focus going to be exclusively on Rhinoceros? Either way, I shall be waiting. Raisin: Exclusively rhinos, but [redacted]. We've done a first round of playtesting & revision. The second prototype is ready for printing & testing. Good rapid progress so far!